The observations showed a distinct cometary appearance, with a sharp central condensation, compact coma and a wide, fan-shaped tail. This is no ordinary comet, and supports the theory and initial spectral observation work by a team using the keck telescope in Hawaii. Closer analysis of their object (part of a binary known as the Patroclus pair) showed that it was made of water ice and a thin layer of dust, but at the time of writing, no direct images of a Jupiter Trojan showing evidence of a coma and tail had been taken. The Faulkes teams above image, combined with the original observations by Grauer clearly show a cometary object, thus confirming the Keck team’s hypothesis. According to the CBET released today “After two nights of observations of Grauer’s comet had been received at the Minor Planet Center. 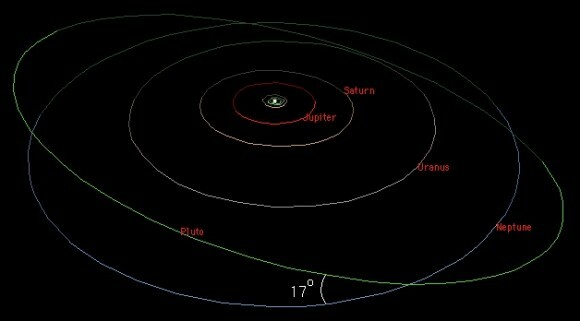 The observations have now proved it is not a minor planet, but a comet. This discovery could provide new clues about the evolution of the Solar System, suggesting that the Gas Giants formed closer to the Sun and as they moved further away, they caused massive perturbations with Kuiper Belt objects, trapping some in their own orbits. Comet Elenin, the supposed “doomsday comet” that has inspired so much confusion and controversy since its discovery in December 2010, may have broken apart completely during its recent pass around the Sun. Discoverer Leonid Elenin posted the image above earlier today on his website, SpaceObs.org. Taken with the International Scientific Optical Network’s 18″ telescope in New Mexico (ISON-NM), it shows what may be the remnants of Elenin, a faint cloud barely visible after its exit from behind the Sun. Ground-based viewing of Elenin’s remains may be hampered over the next few days by the full Moon, he adds. Although many rumors have been spread about the catastrophic danger Elenin poses to humans, in reality the comet was never a threat. Not expected to come any closer than 22 million miles (35 million km) to Earth, it’s been previously speculated that Elenin would most likely disintegrate during its current orbit. Hopefully this helps put some of the doomsday nonsense to rest! See Leonid’s latest post on his site here. [/caption]What are comets made of? Good question! Comet nuclei are loose collections of ice, dust and small rocky particles, ranging from a few kilometers to tens of kilometers across. As a comet approaches the inner solar system, solar radiation causes the volatile materials within the comet to vaporize and stream out of the nucleus, carrying dust away with them. The streams of dust and gas form a huge, extremely tenuous atmosphere around the comet called the coma, and the force exerted on the coma by the radiation pressure of the Sun and solar wind cause a tail to form. The tail always points away from the sun. In order to understand what are comets made of, we need to break down the three main parts of the comet: the nucleus, coma, and tail. Comet nuclei are known to range from about 100 meters to more than 40 kilometers across. They are composed of rock, dust, ice and frozen gases such as carbon monoxide, carbon dioxide, methane, and ammonia. Sometimes called dirty snowballs, recent studies have shown that the ice of a comet is covered by a crust. Comets also contain a variety of organic compounds as well as the gases already mentioned. Some of these are methanol, hydrogen cyanide, formaldehyde, ethanol, and ethane. More complex molecules such as long-chain hydrocarbons and amino acids may also be in comets. Because of their low mass, comets cannot become spherical under their own gravity, and will thus have irregular shapes. The coma is the the nebulous envelope around the nucleus of a comet. It is formed when the comet passes close to the Sun on a highly elliptical orbit. As the comet warms, parts of it turn from solid to gas(sublimate). Larger charged dust particles are left along the comet’s orbital path while smaller charged particles are pushed away from the Sun into the comet’s tail by solar wind. This helps astronomers distinguish comets from stars because it creates a fuzzy appearance. The tail is illuminated by the Sun and may become visible from Earth when a comet passes through the inner solar system, the dust reflecting sunlight directly and the gases glowing from ionization. The streams of dust and gas each form their own distinct tail, pointing in slightly different directions. The tail of dust is left behind in the comet’s orbit in such a manner that it often forms a curved tail called the antitail. At the same time, the ion tail, made of gases, always points directly away from the Sun, as this gas is more strongly affected by the solar wind than is dust, following magnetic field lines rather than an orbital trajectory. Paralax viewing from the Earth may sometimes mean the tails appear to point in opposite direction. Understanding the three parts of the comet is essential to know what are comets made of. Here is an article with a little more detail. Here on Universe Today there is a great article on a comet/asteroid hybrid. Astronomy Cast has another outstanding episode about solar dust. Proteins are a major component of all living cells, and amino acids are the building blocks of protein. Just as the 26 letters of the alphabet are arranged in limitless combinations to make words, life uses 20 different amino acids in a huge variety of arrangements to build millions of different proteins. 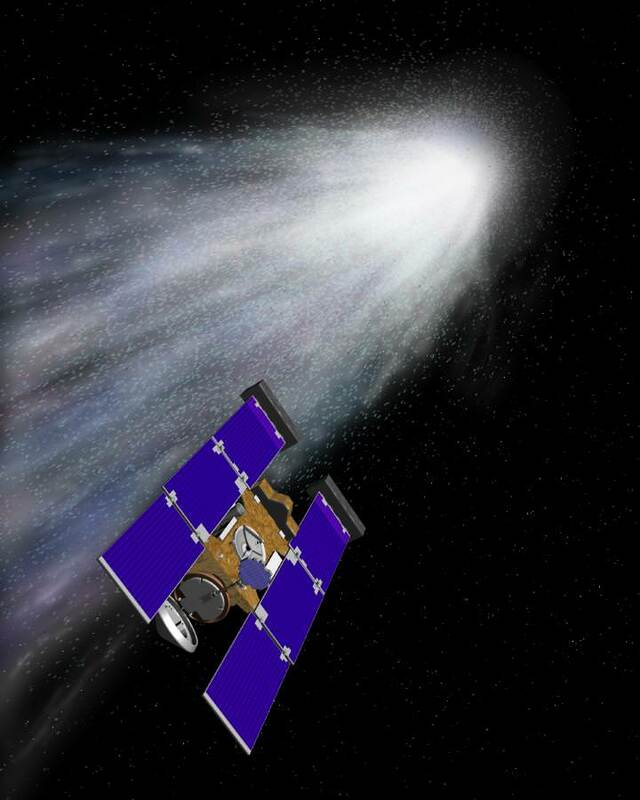 As Stardust passed through dense gas and dust surrounding the icy nucleus of Wild 2 (pronounced “Vilt-2”), special collection grids filled with aerogel – a novel sponge-like material that’s more than 99 percent empty space – gently captured samples of the comet’s gas and dust. The grid was stowed in a capsule which detached from the spacecraft and parachuted to Earth on January 15, 2006. Since then, scientists around the world have been busy analyzing the samples to learn the secrets of comet formation and our solar system’s history. Earlier, preliminary analysis in the Goddard labs detected glycine in both aluminum foil that lined the collection grids, as well as in a sample of the aerogel. However, since glycine is used by terrestrial life, at first the team was unable to rule out contamination from sources on Earth. “It was possible that the glycine we found originated from handling or manufacture of the Stardust spacecraft itself. We spent two years testing and developing our equipment to make it accurate and sensitive enough to analyze such incredibly tiny samples,” said Elsila. The new research used isotopic analysis of the foil to rule out that possibility. Isotopes are versions of an element with different weights or masses; for example, the most common carbon atom, Carbon 12, has six protons and six neutrons in its center (nucleus). However, the Carbon 13 isotope is heavier because it has an extra neutron in its nucleus. A glycine molecule from space will tend to have more of the heavier Carbon 13 atoms in it than glycine that’s from Earth. That is what the team found. “We discovered that the Stardust-returned glycine has an extraterrestrial carbon isotope signature, indicating that it originated on the comet,” said Elsila. The team’s research will be published in the journal Meteoritics and Planetary Science. Back in 1996, astronomers discovered a strange object in the asteroid belt. They decided it was either a “lost” comet or an icy asteroid, as it ejected dust like a comet but had an orbit like an asteroid. No one had ever seen anything like the object, called 133P. Ever since it was found, astronomers have wondered if it was just an oddity — one of a kind. We now know it is not, and the discovery of more of these half asteroids/half comets means there is a new class of objects in our solar system. Hsieh thought it was unlikely a comet could have been kicked around enough to end up in orbit in the asteroid belt, so he followed the assumption that 133P was a dynamically ordinary, yet icy main-belt asteroid. He set out to prove the hypothesis that 133P-like objects should be common and could be found by an well-designed observational survey. Hsieh made 657 observations of 599 asteroids in the asteroid belt and found 176P/LINEAR. He also determined the asteroid is partially made of ice, which is being ejected following a collision with another object, thus the comet-like attributes. Additionally, since there is evidence for past and even present water in main-belt asteroids, Hsieh says statistically there should be around 100 currently active Main Belt Comets (MBCs) as these objects are called, among the kilometer-scale, low-inclination, outer belt asteroid population.